HF: The first Query and Answers, Kwok Acheong + P&O connection, linked below, sought further information about his taking over the ‘shipwright and engineering department’ from the P&O Steamship Company in 1854 in Hong Kong and says I can find nothing about this particular subject: where was the Dept, what particularly did it do and what happened to it post Kwok Acheong? Can anyone provide some answers? Also when was he born? This biography comes from the superb Dictionary of HK Biography with this particular entry written by Carl T Smith and Christopher Munn: “One of the richest men in 19th-century Hong Kong, and an influential leader of the Chinese community, Kwok Acheong was born into the boat dwelling community in Canton, but was later admitted to the clan of Tam Achoy, a friend and business associate. 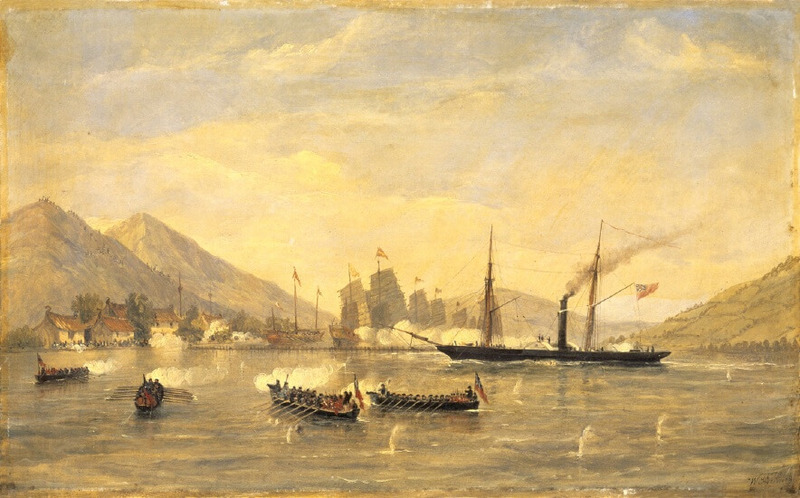 Kwok organised a provisioning system for the British expeditionary force during the first Opium War and served as a pilot on HMS Nemesis during the attack on the Bogue Forts in 1841. He was one of the earliest settlers in British Hong Kong, though he did not receive the extensive land and privileges enjoyed by Lo Aqui. He became compradore for the P. & O. Steamship Company after it established a branch in Hong Kong, and when the company disposed of its shipwright and engineering department in 1854 he took it over. Later on, in the 1860s, he developed a fleet of steamships, which provided keen competition for the European-controlled Hongkong, Canton and Macau Steamboat Company. His other businesses included a bakery, a near monopoly on the import of cattle into the colony, the main licensed slaughterhouse (hence the nickname Ngau Lan Atsung or ‘Cattle-market Atsung’), and a general merchant house, which went by the name of Fat Hing. Kwok accumulated large amounts of property and by 1876 was the third-largest ratepayer in Hong Kong (after Douglas Lapraik & Co. and Jardine, Matheson & Co.). Kwok demonstrated his loyalty to the British by ignoring the calls for boycotts during the difficulties of 1856 and by supplying the British forces in the Second Opium War, from which he profited considerably. With Tam Achoy, he became influential among the Chinese in the colony. His name appears prominently on numerous petitions to the government and subscription lists for charities during the middle decades of the 19th century. He was a member of the Kai Fong Committee in 1872 and was frequently consulted by the government about affairs affecting the Chinese community. He also became one of the original directors of the Tung Wah Hospital, where he appeared on ceremonial occasions dressed in the robes of his purchased official Chinese rank. 19th Century Tomato Ketchup production in Yau Ma Tei – where exactly?